The golden age of pictorial mapping may have been between the 1920s and the 1940s, but occasionally contemporary artists resurrect the form with surprising results. 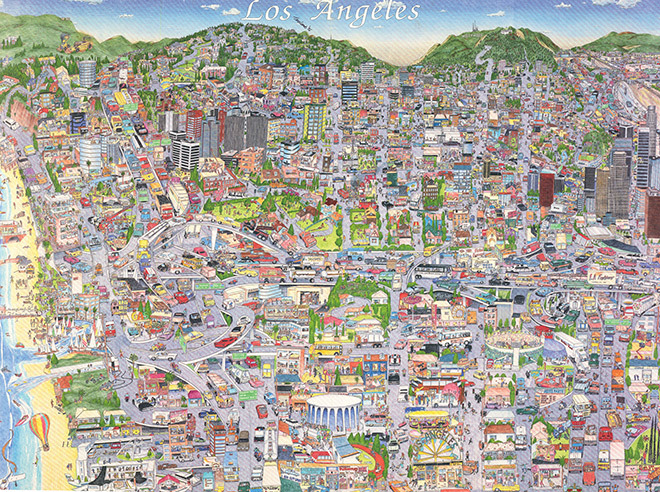 Unlike the boilerplate colorful balloon pictorials used to advertise local businesses, Tom Lamb created a quirky and frenetic Los Angeles brimming with possibilities in the watershed year of 1996. Lamb includes old tourist draws like Melrose avenue, Ports of Call in San Pedro, the Spruce Goose in Long Beach and the Dorothy Chandler Pavilion, which would have been slightly more enticing 20 years ago. He also shows the 110 freeway slicing through downtown, overflowing with cars inching toward Hollywood or Pasadena. The artist demonstrates a dark, L.A.-esque sense of humor with the strange image of a runaway drunk driver being held at bay by dogs and a home owner pointing a shotgun his way just a few blocks from the Watts Towers (in the bottom right hand corner of the map). At center, just below the “Pack A Punch” billboard, there is some kind of running fight going on while politicians pose for cameras at a nearby opening of a Youth Program. The map reads like a Simpsons episode with tons of fictitious businesses dotting the peoplescape. 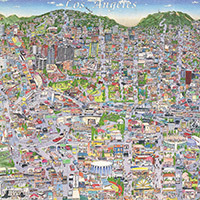 While Lamb throws geographical accuracy to the wind, he does capture the wild vitality of L.A. in the ‘90s by creating a bubbling cartographic stew full of chaotic activity.